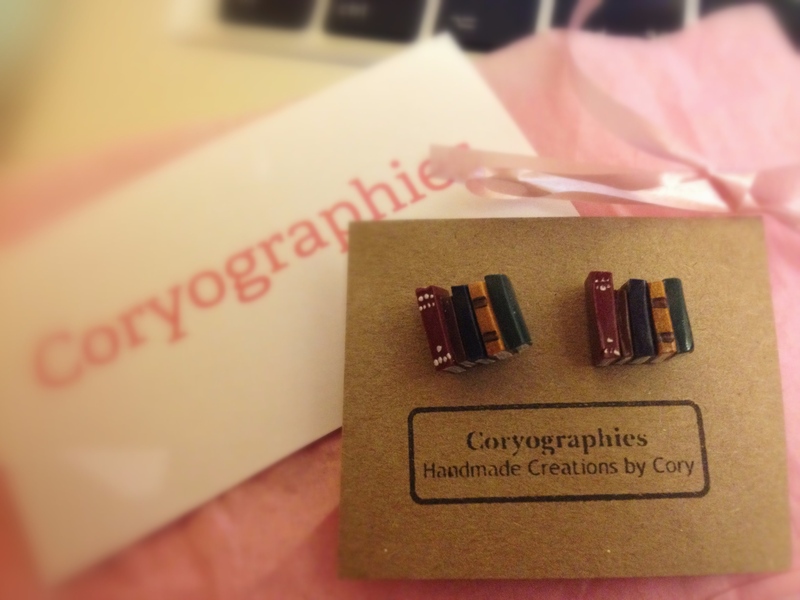 I won a pair of Coryographies Book Stud Earrings! If you haven’t already guessed, I’m rather excited about the fact that I won a gorgeous pair of Book Stud Earrings, and they arrived in the post today. If you follow me on Tumblr (which you can do here), you might recall me mentioning Coryographies back in August when my sister got me a Coryographies Bookshelf Necklace for my birthday. Now, I have a pair of really cute earrings to match, and I can’t wait to wear them. It was a brilliant start to the month to find out that I had won them. Thanks Cory! As well as the various designs of Bookshelf Necklace and Book Stud Earrings available from the Coryographies Etsy shop, Cory also makes an Ancient Book Ring, Sushi Earrings, Teapot Earrings, Teapot Necklaces and more. You can check out her blog here too.